One Saturday morning this summer, Tim Meade stopped at the 76 gas station on PCH and Sunset, where he overheard a conversation that would enrich the lives of himself, his daughter and his neighbors. It didn’t seem like much at first. A German man was speaking to the cashier in broken English about his family’s rental car, which had broken down. Meade, a fix-it sort of guy, offered to take a look at the car. He soon determined that its computer was defunct, the traction system was down, and it was not safe to drive. The family of four, including two teenagers, had ended up sleeping on the beach the previous night because they were simply stuck. They had lost the use of their American cell phone due to liquid spilling on it, so Meade offered to call Hertz to see if he could get a new car delivered to them. No luck. The representative told him that the family had to take a taxi to the airport to get a new car. Meade argued with Hertz that its car had stranded the family, so Hertz should deliver a new car instead. Hertz promised to call him back, and Meade decided to invite the Brummer family to his Highlands home to await that call. Isabella Brummer, Madison and Tim Meade, Axel Brummer, Alessa Brummer and Johan Brummer in the Highlands. Meade, whose 10-year-old daughter Madison was staying at her mother’s house at the time, showed the two teenagers the pool and recreation center across the street from his house and offered their mother the use of his guest shower if she’d like. He had a Costco casserole that he threw in the oven for lunch. The teenagers, a 16-year-old girl, Alessa, and a 14-year-old boy, Johan, soon began making friends with both kids and adults at the pool. They were also a delight to host. Both sang and played the piano and guitar. They did gymnastics in the backyard. So they shared a dinner together of home-cooked German food, and the next day Meade drove the father, Axel Brummer (a financial planner), to the Santa Monica Hertz office to pick up a new car. It wasn’t there. He loaned them an extra car he had until Hertz finally did drop off a new one, and they toured Los Angeles as had been their original plan—visiting Venice Beach, Hollywood and other tourist areas. Meanwhile, Meade’s neighbors at the pool were curious about the new visitors. When the neighbors learned the family had just met Meade, they said, “What are you talking about? That’s crazy.” And then they decided they wanted to help too. Every hour a different neighbor would pop by with something. “It galvanized my neighborhood and gave them something to rally around,” Meade said. “That’s the big story, not me. One lady had a bunch of tomatoes from the garden. Another had a cake. Another said, ‘Why don’t you send them to our house?’” His daughter, Madison, got to meet them via Facetime first and then in person on Wednesday, and she immediately took to the family too. 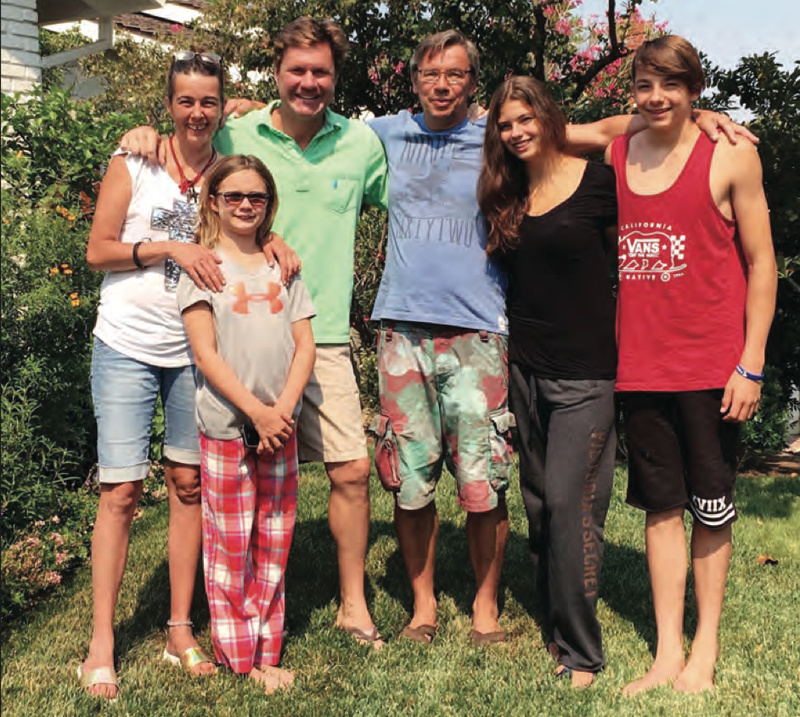 As they embraced this European family in their midst, neighbors who had only known each well enough to share the occasional wave were fast becoming friends. When the week had passed, Meade and his daughter decided to throw a goodbye party to mark the family’s last night in Los Angeles, and the teens and Madison developed a concert that they delivered to about 30 attendees over dinner. And the friendship didn’t end when the Brummers returned to their home just outside Berlin. Each week, the Brummers chat with Meade via Facetime, and for spring break, Meade and his daughter plan to visit Berlin and stay with them. The whole experience is still emotional for Meade to discuss. “There is terrible stuff going on in the world, but that doesn’t mean you can’t make a teeny-tiny difference,” Meade said. He described how the Brummers’ visit was like the fable Stone Soup, in which the soup starts with a rock tossed in a pot of boiling water, but as people drop in a few carrots and a potato and more, it eventually becomes something wonderful to share.